This is a coming together of two of my favorite dishes, from two of my favorite cities. Montreal-style smoked meat with a New York-style Reuben's dressing & sauerkraut. And because it’s the summer time a burger has to be involved. In a bowl, combine your mayo, ketchup, lemon juice, Worcestershire, horseradish, and paprika. Season with salt and pepper. Cover with plastic wrap and place in the fridge. Divide your ground beef into 8 equal portions, and shape into patties that are just larger than your burger buns. Place a thumbprint in the center of your patties to help stop them shrinking. Heat a large pan over medium-high. When hot, drop in your butter and let it melt. Working in batches, fry your burgers for 3 - 4 minutes per side until cooked through. Working on a baking tray, place a slice of Swiss cheese on top of each burger, and stack them into four double cheeseburgers. Divide your smoked meat into 4 equal portions, and place on top of each burger. Transfer the tray to your oven and allow the cheese to melt (4 - 5 minutes). 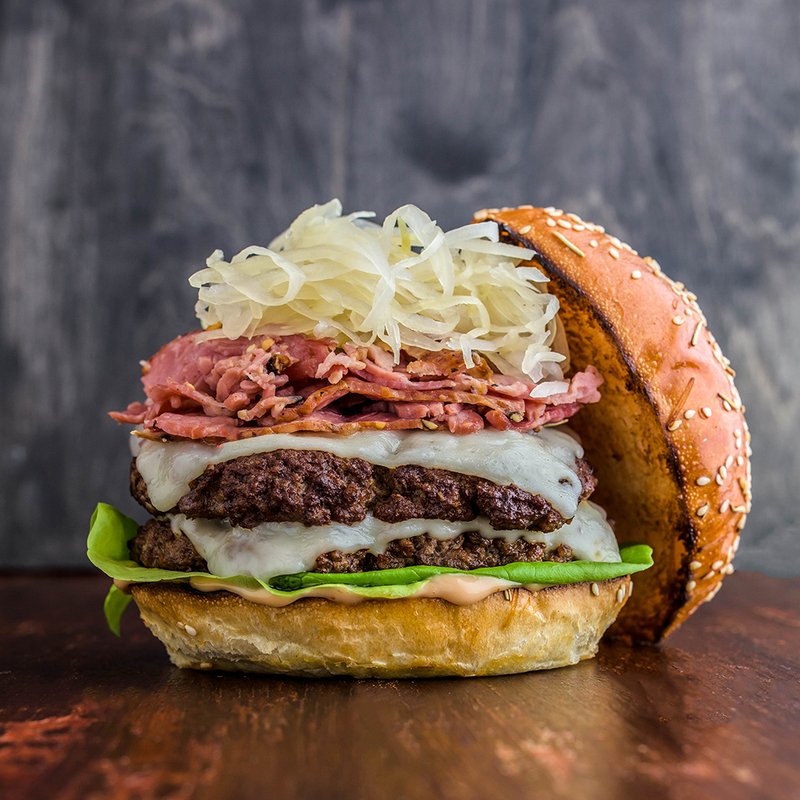 Assemble your burgers with 2 tablespoons of sauce, a burger stack, and 1/4 cup of sauerkraut. Serve with pickles on the side.